The early weeks of each new school year offer teachers distinct opportunities and challenges. It is during this time—when expectations and routines are established, rules generated, and goals articulated—that the foundation is laid for a productive and cooperative year of learning. As teachers, we work hard to convey, from the very first day of school, the important message that we will do high-quality work in our classrooms. We also work to convey the message that we will do this high-quality work in an atmosphere of support and collaboration. But this atmosphere does not just appear by our decree. 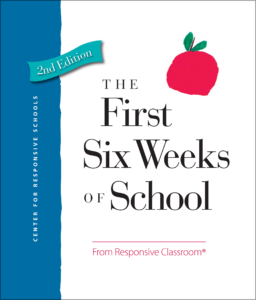 It must be carefully constructed upon many small, but critical, building blocks, and the first six weeks of school is the time to do it. We see the first six weeks of school as a distinct period, a time of many introductions. We introduce students to the people of the classroom and school community, to the classroom and school environment, and to the expectations we hold about learning. We also introduce and establish expectations for behavior, the limits we will set, and the ways we will enforce those limits. We introduce the routines that help students learn while taking care of each other and the environment. We carefully structure the first six weeks so that students will participate actively in all of these introductions. They practice the expected skills and behaviors—at first with very close teacher guidance and structure, and then, as their familiarity and competence grow, with increasing amounts of independence. Though the details differ with different age groups, with the content of the curriculum, and with the organization of the room, there are four broad aims in the first six weeks curriculum. Create a climate and tone of warmth and safety. Students can come to know each other and develop a sense of belonging through activities that help them define their commonality and their differences. Deliberately focusing on group-building activities during these weeks helps create the trust and safety essential for active, collaborative learning. However, this sense of trust is not built solely on warmth and friendliness. It is also built upon students’ assurance that there are reasonable limits and boundaries for behavior and that their teacher will enforce them. They must see that their teacher will exercise vigilance and good judgment to keep everyone safe. Introduce students to the physical environment and the materials of the classroom and the school, and teach students how to use and care for them. In order for students to feel a sense of ownership for the school environment and materials, they must become familiar with them and have time to explore them. Through school tours for young students and new students, and scavenger hunts and mapping exercises for older ones, we encourage them to get acquainted or reacquainted with the school environment and to feel comfortable in it. Using the technique of guided discoveries, we extend children’s ideas about the creative use of space and materials, develop guidelines about sharing particular resources, and teach children how to care for them. Establish expectations about ways we will learn together in the year ahead. We want to generate excitement and enthusiasm about the curricula we will engage in this year—complicated new math concepts, engrossing novels full of dilemmas to explore, beautiful art materials and techniques for using them, microscopes to observe a previously invisible world. Our learning—whether we are wrestling with an ethical dilemma presented in a history lesson or considering a complicated question about collecting data for a science experiment—requires participation and focused effort, thoughtful questions, and the ability to cooperate and collaborate. We pay attention to the process as well as the products of our learning and hold high standards in both areas. It is our job as teachers to help students achieve these high standards as we learn with and from each other. So, what must students know in order to achieve the highest level of academic work in an atmosphere of safety and cooperation? In a word, students need to function with autonomy: to function independently without constant adult control or direct supervision. Autonomy in a school setting means governing oneself with an awareness of the needs of the community. These needs vary—each year, each month, each week—according to the class composition, students’ maturity, what our classroom space allows, and what materials we have to work with. Even the best-behaved students do not walk in our doors in September with this autonomy. Each year, the details must be intentionally established during the first weeks, bit by specific bit, through definition and constant practice. Some students will acquire a high degree of autonomy relatively quickly; others will struggle and need support all year. Building this autonomy is the focus of our curriculum for the early weeks of school. It is exhilarating and exhausting work. It is an investment that pays off all year long.